The most famous sacred object in the world is guarded in the baroque city of Turin, Italy. Why? 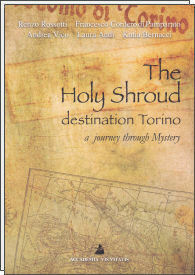 Who has protected The Holy Shroud through I the centuries? What mysterious tris have accompanied it? Why and how are the Templars involved? This is a voyage to the center of a Mystery! Five authors writing from different point of view consider this question filled with an exciting history of a great enigma. It should be remembered that the relic was considered a werful talisman against misfortunes, calamities, and wars. Also 1706 its image was often evoked and painted for protection. The starting point for an ideai itinerary is no doubt the wonderful Piazza San Carlo, where on the sides of Via Alfieri and Via Santa Teresa two small frescoes represent the Holy Shroud held by the Virgin Mary. In his Guida de' forestieri per la Real Città di Torino (Guide to tbc Royal City of Turin for Foreigners), Craveri mentions the frescoes. In the same square, the Chiesa di San Carlo cannot be missed, with its magnificent major altar whereby Saint Carlo Borromeo is represented while worshipping the Holy Shroud. The Holy Shroud and the Mystery of The "Templars"